Wine drinkers will tell you that the wine matters, but so does the glass! Make the day of any wine lover with Helloprint's Sauvignon White Wine Glasses. With a sturdy stem that prevents smudges and heat from your hands from diminishing your wine's flavour, print your business logo or design in up to 4 PMS colours onto the modern bowl that is shaped to show off your branding. 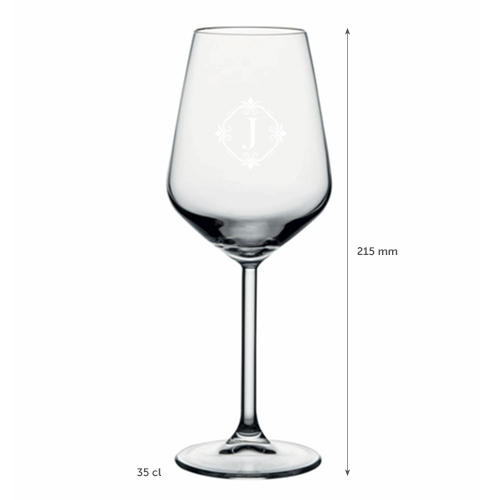 With a charming thin glass rim that only enhances your tasting experience, don't hesitate to compliment your next event or business materials with these tasteful glasses that can also be used for a unique promotional campaign. These dishwasher friendly glasses (Allegro) are sourced from the renowned Dutch 'Royal Leerdam' glass producer; 125 years in the industry for their high quality glassware production. How big is the printable area of this glass? What is the best way to clean the Sauvignon White Wine Glasses? How are the Sauvignon White Wine Glasses packaged? Fonts should be at least 5 pt. The printable area is 4x4cm for this glass. For the exact location check the template. For the delivery of your sauvignon white wine glasses we use multiple carriers. Because of the highest reliability, in most cases we use UPS or DPD.